Brace yourselves, winter is coming! For many, the Australian winter is a great time to snuggle up by a warm fire and enjoy the pitter-patter of rain on the roof. But for green thumbs, and those who love spending time in their gardens, it can be a difficult and frustrating time of year. Trees get stripped down, plants become tattered, nicely manicured flower beds grow sodden and sore. It’s not a good look and it feels like all your hard work gets undone fast by the cold, steel grasp of the elements. Thankfully, all is not lost. In fact, Winter can be the perfect time to tick off plenty of gardening essentials, plant some tasty vegetables and give your garden the tidy it needs to launch confidently in Spring. So if you want to get your gardening fix over the cold season, here are five gardening tips for winter worth tacking to the kitchen fridge door. If you’re reading this and it’s not quite winter yet, you’re in luck. 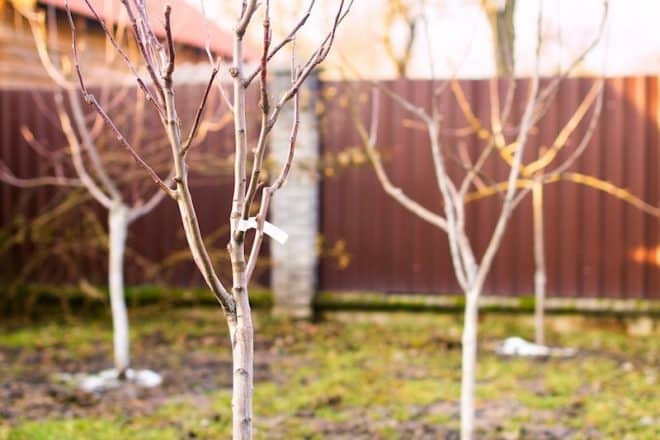 Young trees and those most sensitive to extreme winds can really feel the effects of a harsh winter and incur damage that will make you wish the clock could be turned back to early May. Thankfully it’s easy to protect against. To prevent tender bark on younger trees from being eaten up by hungry winter critters, get out and wrap the stems or trunks with wire. You can also use commercial tree guards for this. Screen your evergreens (especially those with broad leaves) from heavy wind and howling storms by setting up a tent around them. Cloth or potato-sacks (or similar material) works wonders here. The positive side of stripped-down plants in winter is it makes them easier to prune and tidy. Taking care of dead leaves or areas with busy growth is a (winter?) breeze at this time. Rose pruning should be a priority if you grow them – be ruthless and reduce it to three or four main stems. Spray them with lime sulphur if you have it, or something similar. This will clean up any nasty pests and catch any diseases before they impose themselves. Other considerations for winter pruning include hydrangeas, wisteria and gardenias. The latter are a bit of an exception, as they’re best approached later on around early August. Winter is also the perfect time to get stuck into your grapevines to have them looking their finest when the warmer months come. During each winter there’s a slow collection of fallen leaves, wind-blown sticks and twigs, and drifted pieces of debris that accumulate over your paths, walkways and lawns. There’s not much you can do about the weather, but that doesn’t mean you can’t take advantage. Gather the family together for a clean-up mission with a good cause – mulch and compost for the garden. Now’s a good time to rake it all up and stockpile it for use at a later time. Break sticks up as you go, and place them in a pile safe from elements. They’ll save you money on winter firewood and make evening barbecues much easier. After a long period without rain, the grass in your yard can easily compact up and produce a host of bothersome weeds. This can particularly happen in the lead up to an Australian winter. You can use this time to Aerate your lawn and give it much needed moisture to help it revitalise from September onwards. To do this, use a garden fork or a specialised lawn aerator, before dressing the top with a small layer of coarse sand. When Spring comes around, schedule in time to fertilise. Take a look at our guide to lawn care for further information. Winter happens to be a great time for planting a variety of fresh vegetables, so make sure you use the time wisely! When it’s not so chilly and grey outside, venture out and plant your English spinach, snow peas, cabbage and lettuce. Some varieties are best dug in during cold weather, so do your research to form a winter plan that yields a warming spread for your family. It’s also a smart time to dig a new veggie garden. A raised garden is best for winter vegetables to avoid too much water, and they’re best placed out in the open to soak up the limited sun. Pavers can be great to install as a pathway between the garden and the kitchen. They stop you slipping on a puddle and allow for a sneaky dash out the back to prepare dinner! Avoid the gardening blues this winter by following these tips for a healthier, well-kept garden ready to take on the rest of the year in style. Have your next garden project in mind? Let us brave the weather for you. Give us a call today to see how we can help.